The fabric has been pre-shrunk to ensure its integrity and quality is maintained. These sheets become even softer and more comfortable with every wash.
Material: 100% Cotton. 250 Thread Count. This beige natural vintage softwash cotton sheet set is made from 100% cotton and designed in such a way to be low maintenance and non-iron. With a subtle and neutral colour palette, easy to style and even easier to care for, the Vintage Softwash™ sheet set will become a staple in your home in no time. The range of linen colours have been chosen to suit any decor palette, the change of seasons and interior style trends. 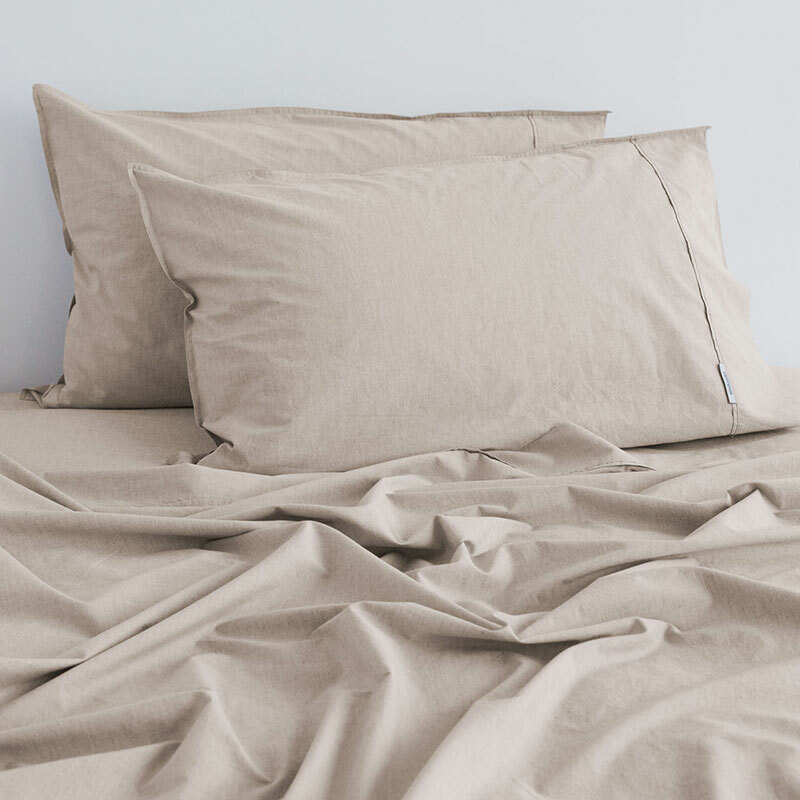 Invest in this quality sheet set which is backed with the Canningvale 5 year warranty and we know this will be a sheet set you can rely on to last you seasons and birthdays, and the odd breakfast in bed! The Vintage Softwash™ Sheet Sets comes in all bed sizes so no one in the family has to miss out. Also available in coordinating Vintage Softwash quilt cover sets and Euro Pillowcases. Care Instructions: Wash separately before use. Wash dark colours separately. Warm machine wash. Do not bleach. Line dry in shade or tumble dry on low heat. Dry without delay. Warm iron if required. Do not dry clean. Canningvale Australia guarantee against manufacturing faults for a period of 5 years from the date of purchase. If the quilt set is found to have a manufacturing fault within that time, they will assess the goods and, should the goods be deemed faulty, provide either a replacement product or a full refund (less postage and handling). Should the faulty product be unavailable or sold out, a similar replacement will be offered. Please note that the Canningvale 5 Year Warranty does not cover the fair use wear and tear that home ware products generally undergo.